Available by the week or nightly! Mountain Watch is one of the best locations on the mountain - right out our door is the Villager Lift and the Stratton Village. Nightly rental requires a 2 night minimum. Our condo is decorated with new carpeting, Jacuzzi tub, and recently remodeled kitchen and bathrooms. Our most recent additions include brand new bedding (Montana lodge pole pine), living room furniture, cookware and place settings. Your time spent in the property will be memorable with our 42” flat screen HDTV, DVD, VCR, high fidelity stereo, PlayStation 2, and wireless Internet access (with laser printer). 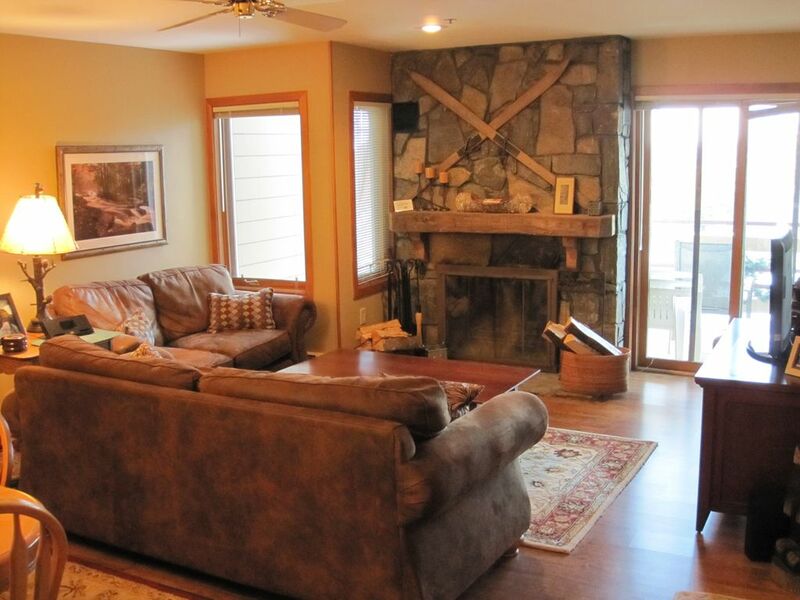 Come enjoy our wood burning fireplace and two outside decks (complete with a Weber gas grill) for fresh mountain air. Price is all-inclusive to provide slope-side gated parking, your own ski locker, utilities and firewood. Cleaning is extra at $120 per stay. Mountain Watch is one of the most sought after locations in Stratton due to its proximity to the lifts and to the village. Park your car in the gated lot right outside the building and there's no need to use it until you leave. Stratton Mountain is Southern Vermont's highest peak with excellent customer service and amenities. Great restaurants and shops are less than 100 yards from our front door. Both bathrooms have been recently renovated. Our building is elevator serviced (very nice after a long day of skiing!!). Brand new place settings for 8, cookware, flatware, and glassware. Connie was very responsive and the apartment was great! This is our third time staying in this condo, and we like it better and better. The condo is thoughtfully provisioned with every tool we need in the kitchen, a broad assortment of family games, and various other little things that make a temporary stay easier. In addition, the direct access to the ski area via the building's side door adds a lot of value. Finally, we have found the owners to be cheerful and professional in every interaction. If you're looking for an modern, luxury condo this is probably not for you. It looks like it was built circa late eighties, early nineties... somewhat dated. If you're looking for a clean, comfortable that is very convenient to the both the lift and Stratton Village this is it. The kitchen is fully equipped. The mattress in the MBR was firm and very comfortable. Parking is located in front of the condo...very convenient. Access to the Villager Lift is conveniently located right out the back door...nice easy in/easy out. I would definitely stay here again. Unit was large enough for my family and had everything you would need. Loved the real wood fireplace. Location is perfect. My family loved the short walk to the village and the slopes. I would highly recommend. Have stayed here now several times and love it. Literally can't beat the location and Connie is an incredible host. We enjoyed our stay very much - there were no problems at all. The condo was the perfect size for a family with three kids. The furniture was comfortable and the kitchen well equipped. The location is good - we have stayed in Hearthstone lodge a few times and the walk to the slopes was brutal. This was a huge improvement. Getting to the slopes went like this: put on boots in the condo and take elevator to the first floor, walk down hall to locker room to pick up skis, then elevator back to second floor. At the end of the hall, exit and walk about 40 yards across court yard to the bottom of the villager lift. Even with the up and down, it was really easy compared to messing with a shuttle or walking up from Hearthstone. Getting back home was even easier. From the bottom of the lift you can ski right down the hill, almost all the way - within 20 feet - of the building door. Overall, we would definitely stay here again. Clean and well kept (if perhaps a little dated) and very well equipped. We loved getting back and starting a fire and had a couple nice family dinners at the big dining room table. Communication with the owner was super easy. Stratton Mountain has fantastic hiking, skiing, world class golf, swimming, fishing, and dining all in the area. Winter activities include ice skating, cross country skiing, tubing, snowmobiling, and sleigh rides in Green Mountain National Forest. Ski: The best skiing in Southern Vermont. Stratton has an excellent ski school for the kids and they consistently rate among the best grooming in the East. With your own ski locker, bring your equipment up at the beginning of the season and leave it there. June 2018 Wanderlust yoga event rate will be $250 per night plus tax (3 night minimum). During Ski Season, we generally do not allow for check-in or check-out on Saturdays. Memorial Day, July 4th, Labor Day and Columbus Day Weekends are 3 night minimums. New Years Eve Weekend 3 night minimum. Call or email with question - might have flexibility with minimums.